I’m not usually one for off-season purchases (it’s already 85 degrees in Dallas! ), but when I find something I really love that works as a wardrobe essential I can’t pass it up. 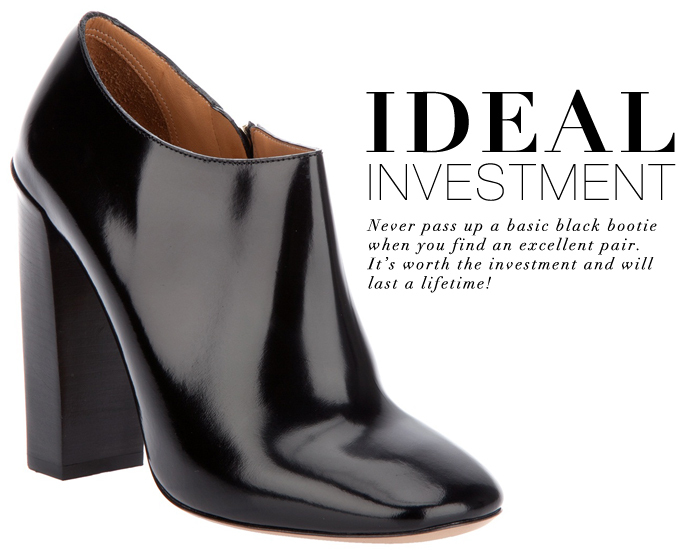 That was my immediate thought when I happened upon these black patent booties on FarFetch. They’re a tad more expensive than I typically spend on shoes, but I believe it really is the ideal investment. I don’t currently have a sleek pair of black booties (not to mention all of my current ones are suede). I adore the cool block heel on these (most I find have a stiletto) – it adds a little something extra, don’t you agree? They’re going to look great with my T by Alexander Wang short suit in early fall and with tights and pretty much anything when it gets chillier. Get these gorgeous booties here!